My fifth grader has always struggled with spelling. I’ve tried a handful of different spelling curricula for him and have never found the perfect fit. He has never been able to grasp spelling because nothing taught him WHY words are spelled the way they are outside of basic phonics. When I started searching for my first grader, I knew I had to find something that taught all of the rules. I couldn’t have him go through what my oldest son has! That’s when I found All About Spelling. You guys, this program is the B.E.S.T. Here’s how it’s all laid out. The first thing that I love about All About Spelling is the tiles! My kids thrive with hands on learning, so having these tiles gives them that kinesthetic approach they love so much. You need to grab yourself a dry erase board to get the letter tiles on. It’s recommended to have a 2×3 foot magentic board and to have it hung horizontally on your wall. We don’t have the space for that, so we are making it work vertically. There are tiles for all of the alphabet (two of each letter) and tiles for each of their rules. As you go through the lessons, you add only the tiles they are working on. Our board is a little empty right now since we’re still in level 1, but it will soon be filled with all of the tiles to help get those rules drilled into my son’s head in a very fun way. The letter tiles app is my favorite part of the whole program!! Since we have a baby in the house, having a bunch of magnets on the wall can get a bit tricky. We have to keep them up and out of reach from her, so the app works perfectly during this season of life. We’re also able to use it while we’re traveling and we can’t have our whole board of tiles. This letter tiles app can be used for both All About Reading and All About Spelling. 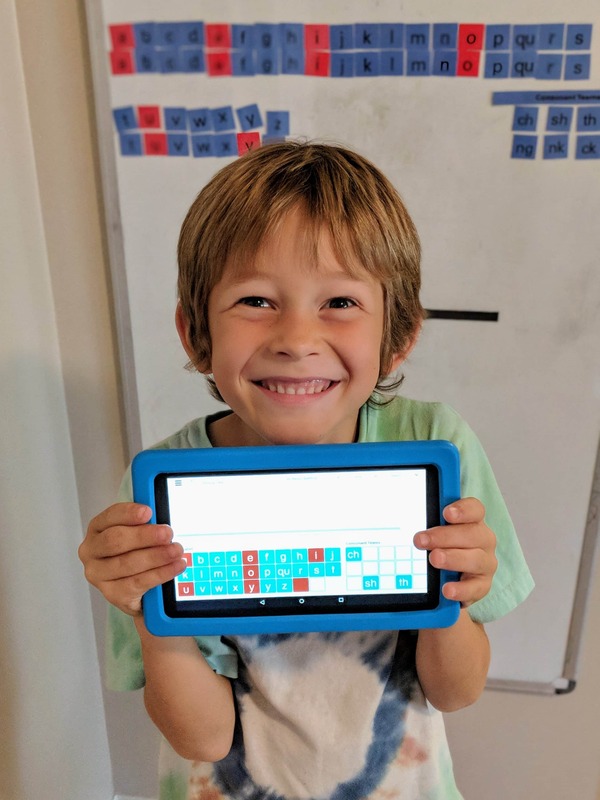 You simply set it to your specific level and lesson on the top of the app and it gives you all of the tiles you need for that lesson. Genius!! And my son thinks it’s like a game and asks to play with it after we’re done. You won’t hear any argument from me, kiddo. All About Spelling comes with four different sets of cards: Phonogram Cards, Sound Cards, Key Cards, and Word Cards. The Phonogram Cards work on each sound a specific letter makes. So, you hold up the letter ‘b’ and your child is supposed to say /b/. But, did you know the letter ‘a’ has three sounds? Or the letter ‘o’ has four sounds? This is what sets this curriculum apart. Even in something as simple as letter sounds, it’s going to teach your kiddos all the rules. The Sound Cards are almost the opposite of the Phonogram Cards. With these, you are supposed to make the sounds and your child is to tell you or write down which letter that sound goes with. 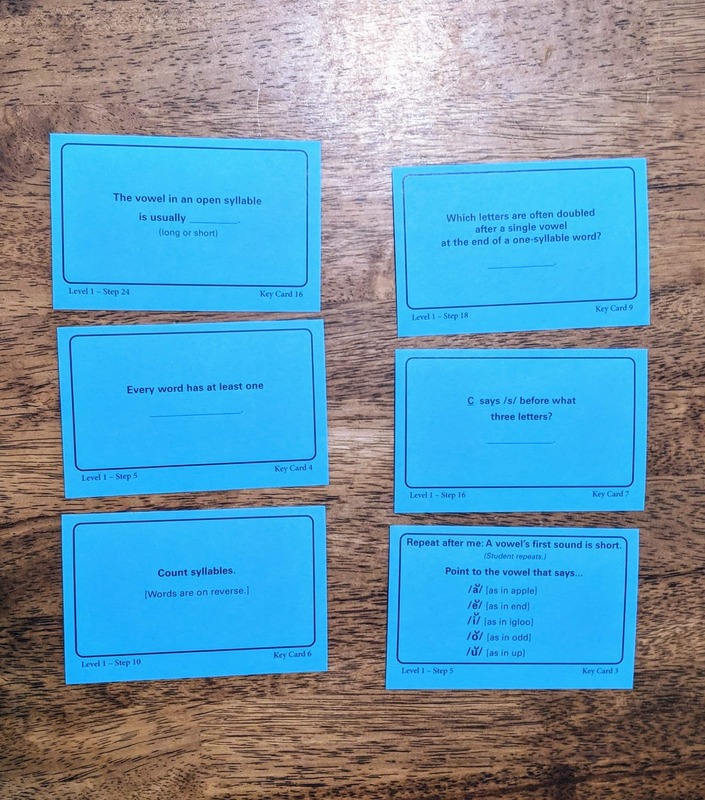 The Key Cards are where the rules come in. Each key card has a key rule on it for your child to memorize. Reviewing these helps to make these rules stick! 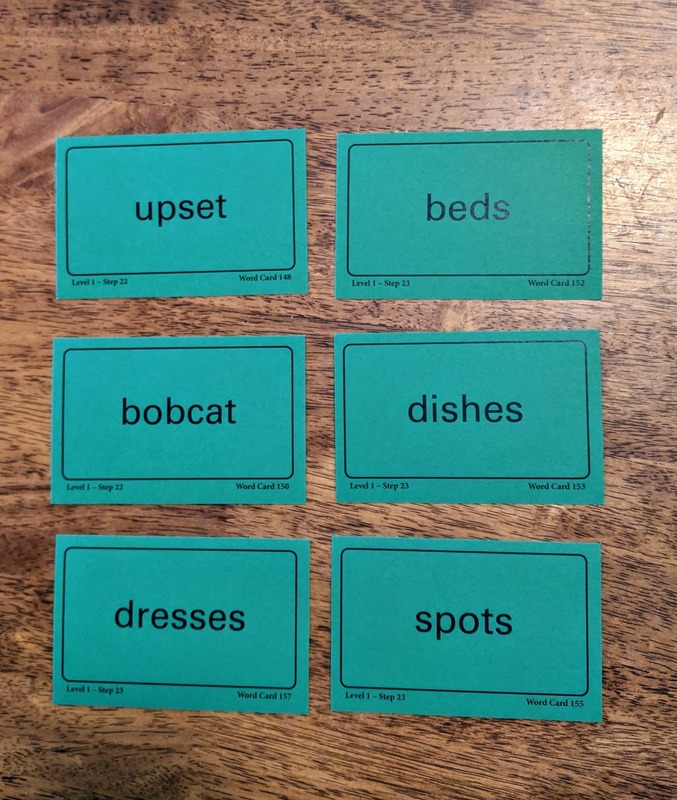 The Word Cards have all of the spelling words for each lesson. 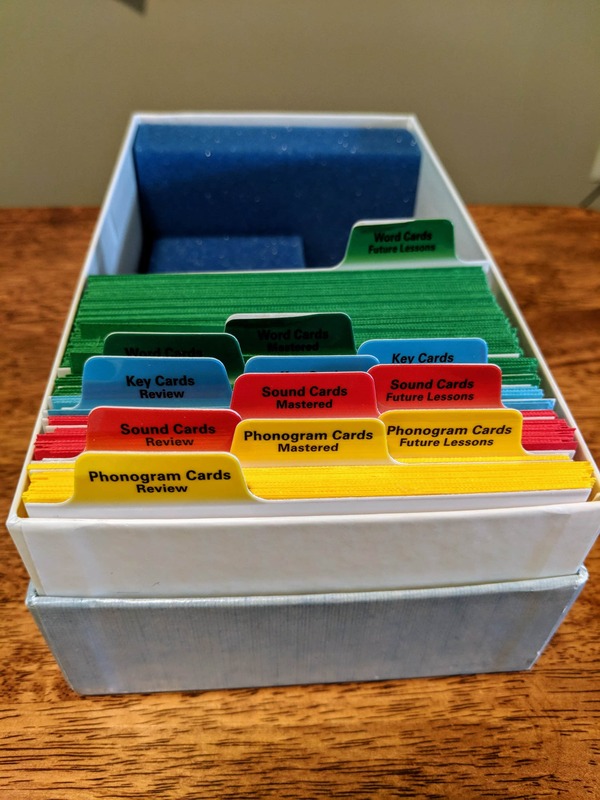 All of these cards have little dividers so you can file all of your review cards, your mastered cards, and your cards for future lessons away so they don’t get mixed up. 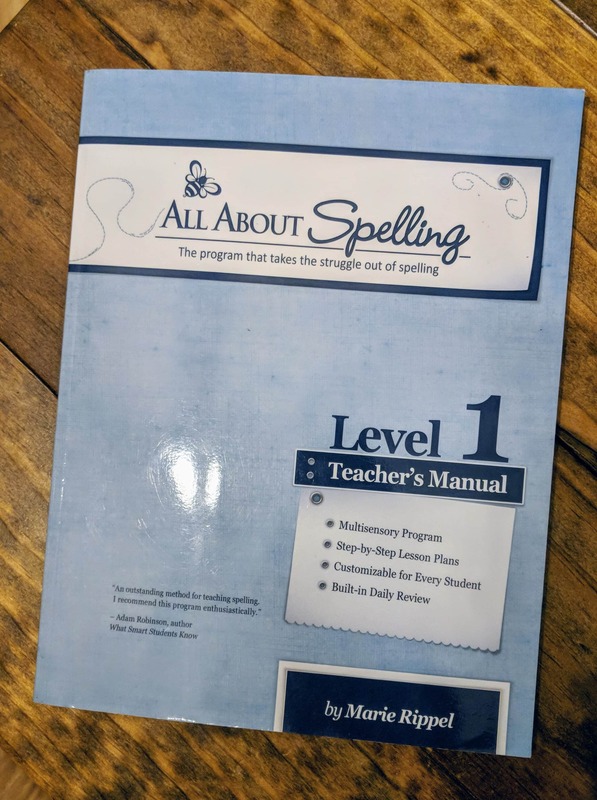 All About Spelling has all of the work and lessons laid out for you. I could do a happy dance any time I find a curriculum that tells me what to do and what to say! It’s an open and go lesson that takes zero prep time at the beginning of the day. 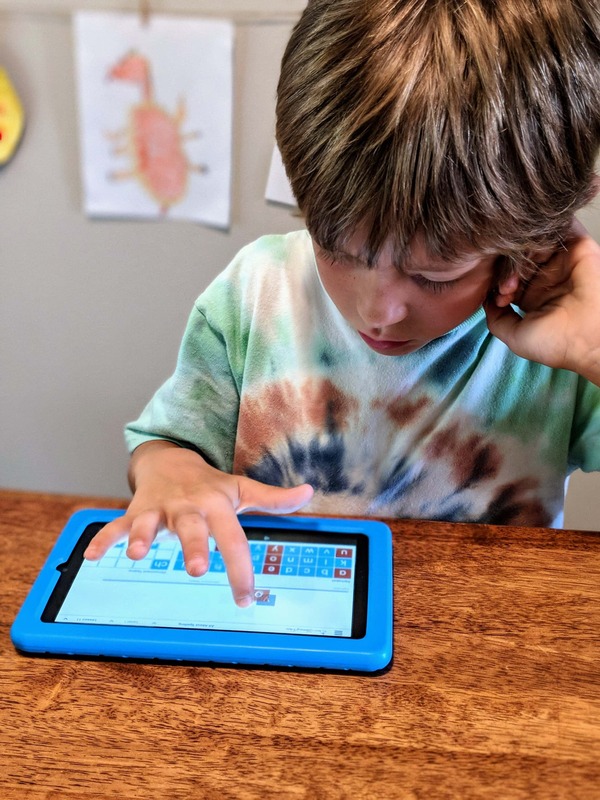 It tells you exactly what you’ll be covering that day, what to say during the lessons, what to ask your child to do during the lessons, and also includes tips along the way so you can get the most out of the lesson if your kiddo needs some extra help, or if you need another way to teach a concept. Having an understanding of why a word is spelled the way it is can make such a huge difference for your little speller in the future. Like I had said, my fifth grader still struggles with spelling. He has been joining us when my first grader does his lessons to learn the basics rules. 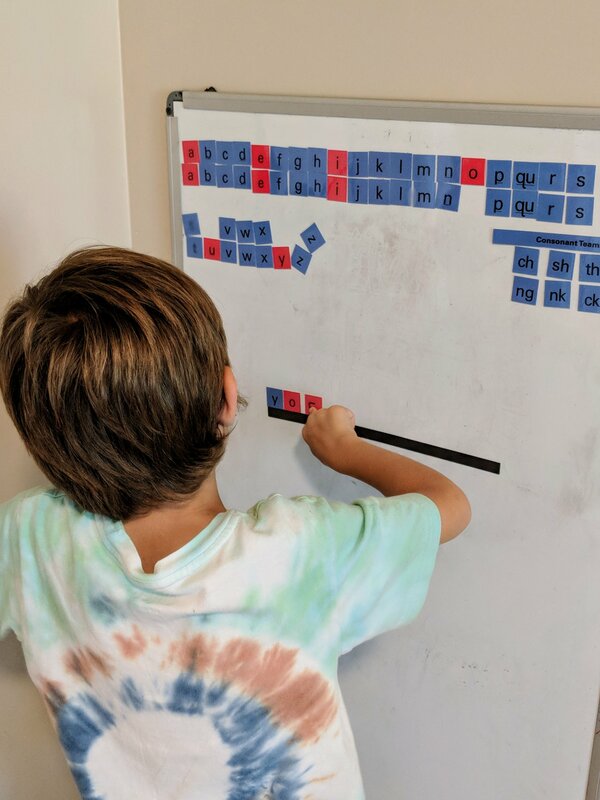 He still has his grade level spelling words to work on, but he is gaining concepts through even Level 1 that he hasn’t been taught before in other spelling curricula. It’s kind of mind blowing. All About Spelling does recommend starting in Level 1, no matter how old your child is. 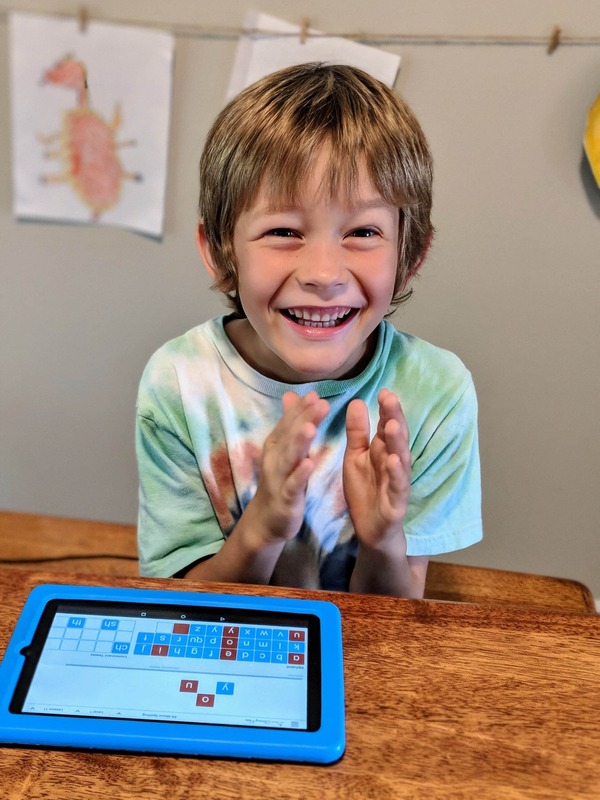 This is to be sure they know all of the original rules so when they are in their grade level of learning they will be able to understand why the program is working the way that it is. It also helps you as the parent learn the method as well. But never fear, your older kids can whiz right through the lower levels to get where they need to be quickly. 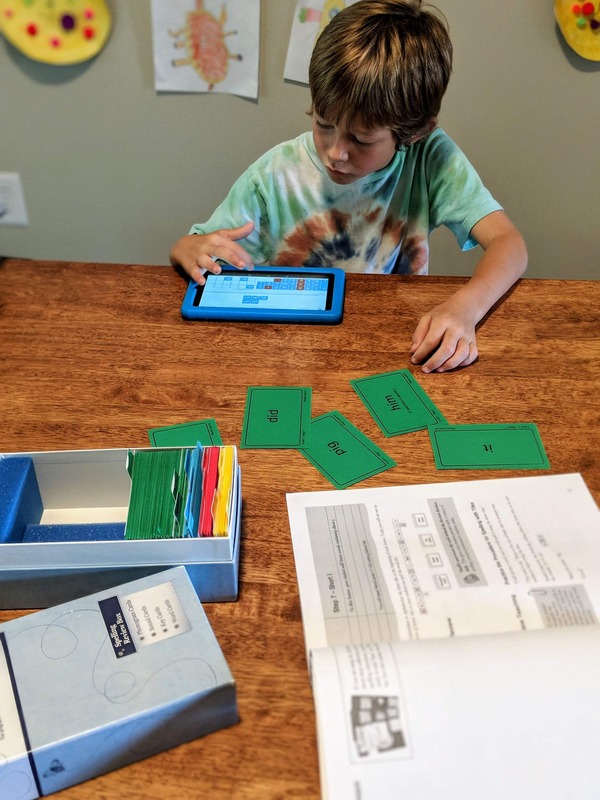 The rules, as well as the hands on approach, have given my kids so much confidence in spelling that I never knew they’d be able to experience. Hooray for no more spelling struggles! All About Learning Press is doing a giveaway right now! 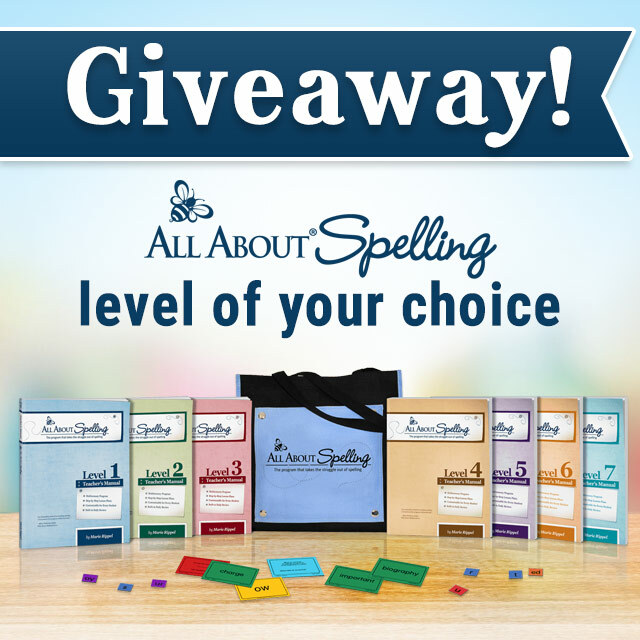 You have the chance to win whichever level of All About Spelling that you’d like until October 31, 2018!! The best part is, if you decide to buy the curriculum this month and you don’t want to wait, they will refund you for the curriculum you bought if you win! Awesome!! So click on the image below to go enter!! Have you used All About Spelling? Head on over to my online homeschool community or in the comments below and let me know how much you love it!